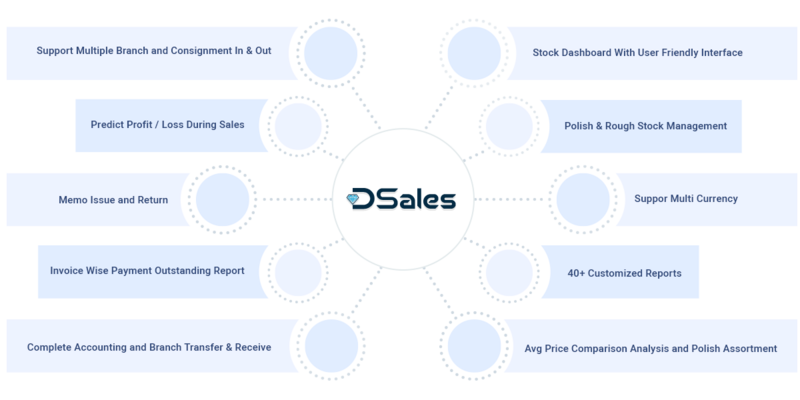 DSales is colud base integrated Software for Diamond Sales Management. It tracks not only inventory & Accounting but also facilitate decision making for emphasizing in which product segment to be focus on sales according to market situation. E-DBM is accessible from anywhere, anytime simply with widely used internet & computers. E-DBM also maintains Stock of Certified Diamonds and Non-Certified Diamonds, LAB issue-return and Branch wise Sales & Stock management. E-DBM is complete Internet base Desktop application so that user can manage the multiple branches also.